Bratislava – Sunshine. Whimsy. Tacos. 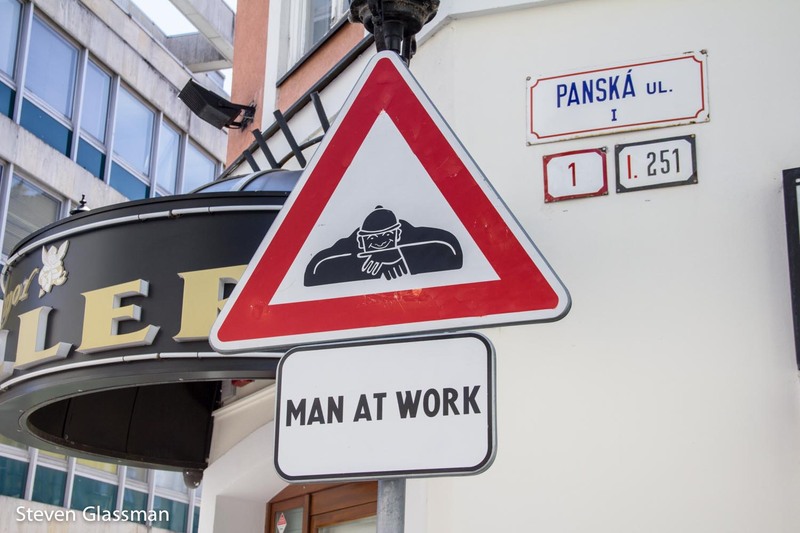 Caveat: Many of the pictures in this post might look a little familiar if you read Confuzzledom, because Bev and Jan went to Bratislava the day after I did, and they took the same free walking tour that I did. We saw a lot of the same things, and even had (delicious traditional) lunch in the same tourist-trap restaurant. She was much faster about getting her Bratislava post up than I was, however. 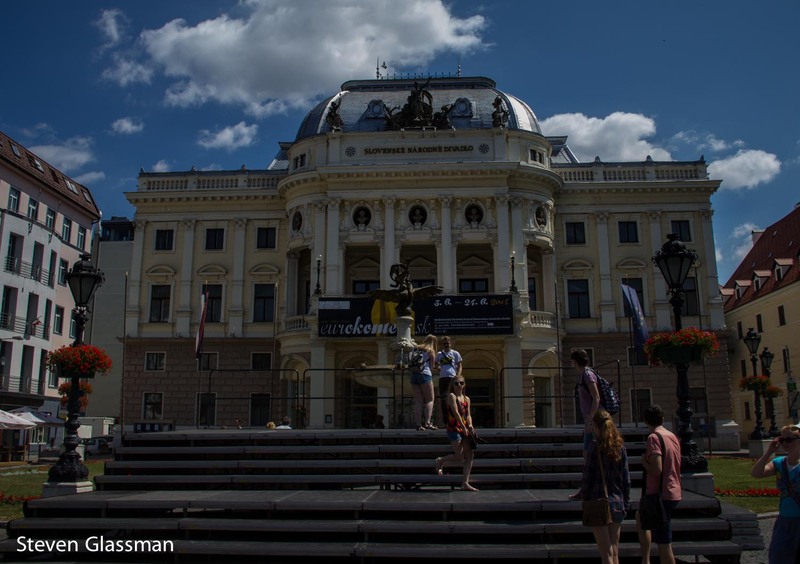 The last time I was in Vienna, I took a day trip to Bratislava, the capital of Slovakia. 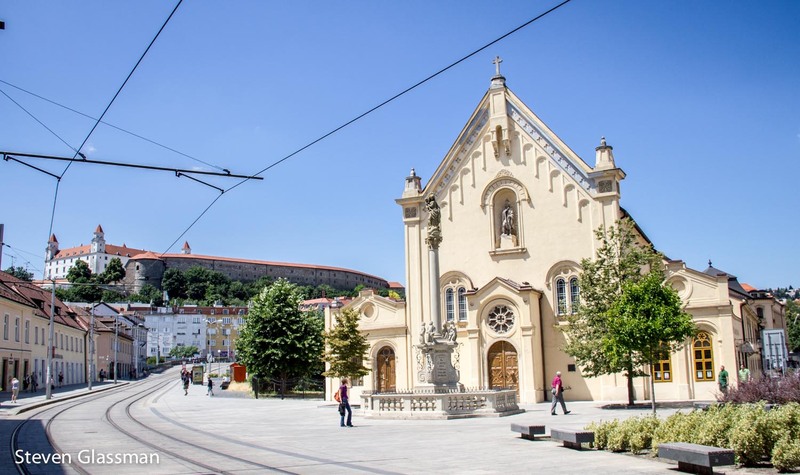 Bratislava is only about an hour away from Vienna by regular commuter train, and you can even take a boat along the Danube river to get there. If your only exposure to Bratislava before now is based on the movie Eurotrip, then this is what you’ll expect the city to look like. These are actual screen captures from the Bratislava section of a very funny movie that gets traveling through Europe dead wrong. Bratislava is far from the post-Communism wasteland depicted in the movie- it’s actually a really pleasant little town. Outside of the center it’s nothing too pretty, but the old part of the city is compact and lovely. 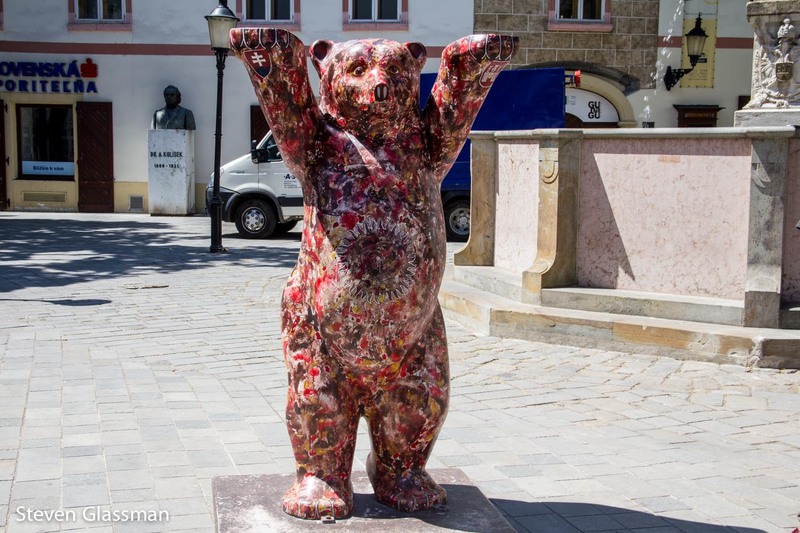 I felt like the center of the city bears marked similarities to Prague, which makes sense if you consider that prior to the Velvet Divorce in 1993, the Czech Republic and Slovakia were one country. 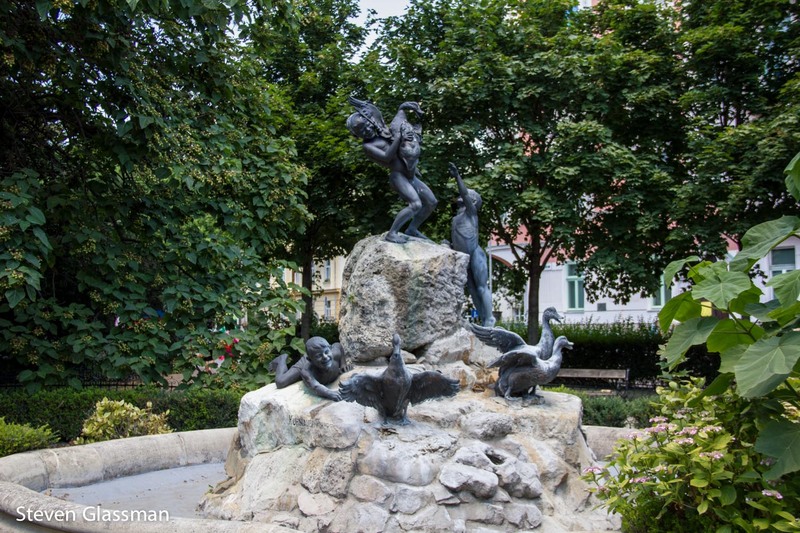 Here’s a fountain in Hviezdoslav Square, a pretty little central area in the city. 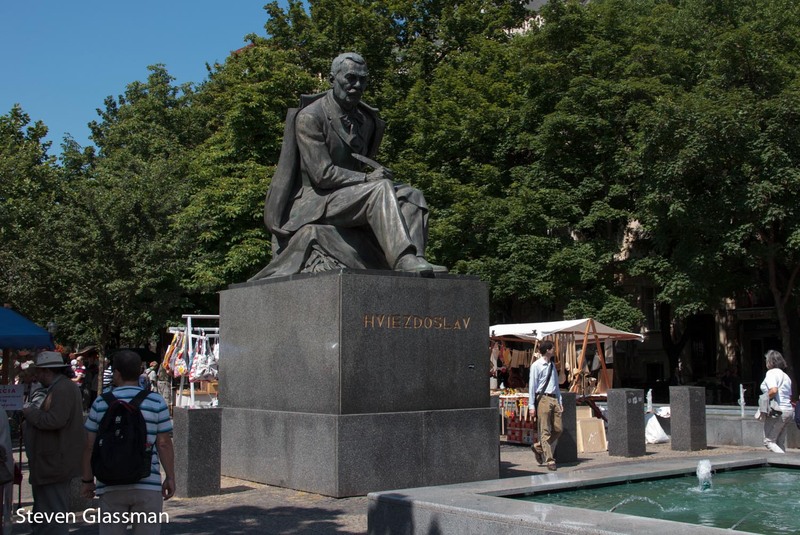 Hviezdoslav Square is named after Pavol Hviezdoslav, a Slovak poet. I meant to check out this place, but didn’t have the chance. Not a wardrobe in sight! 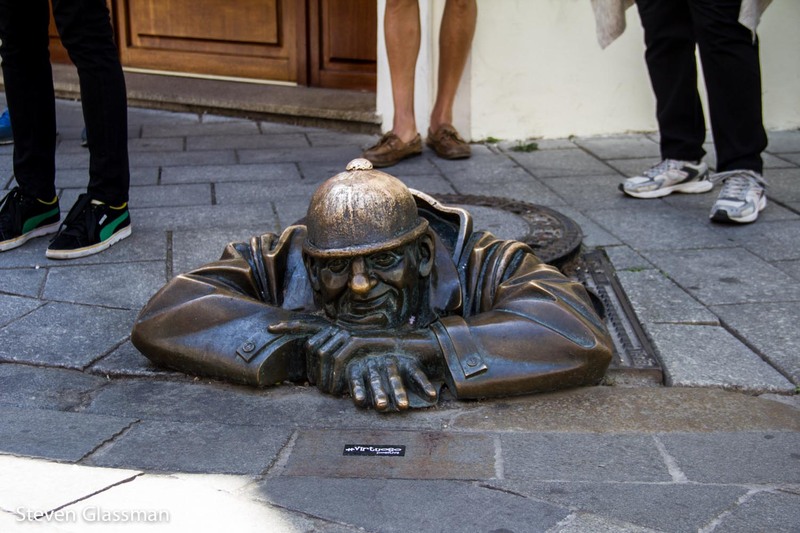 Bratislava is filled with amazing statues in random places. This Man At Work, named Čumil, is very popular. He is sometimes referred to as The Peeper, because he’s checkin’ out the ladies. Of course Man At Work is so low to the ground that he’s been run over a few times. The sign helps his visibility a little bit. Several of the statues are actually owned by restaurants, like this one. 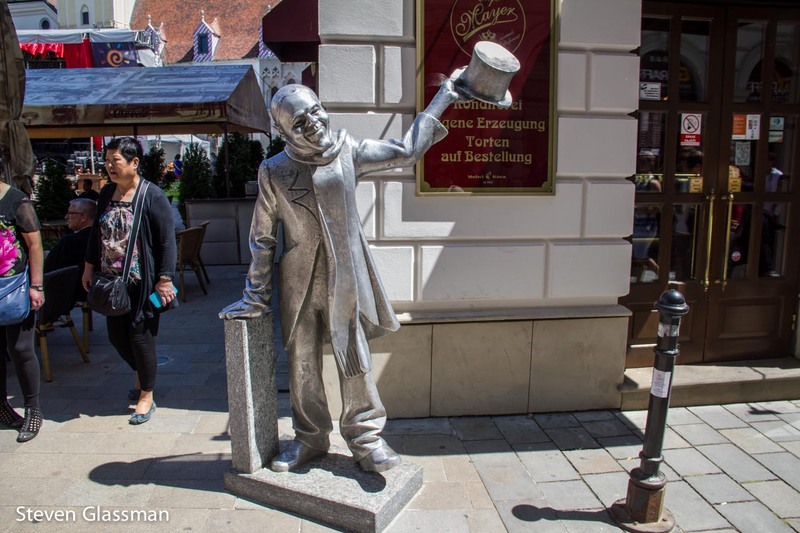 This is a statue of Schöner Náci, a carpet cleaner who reportedly dressed in a black suit and top hat during the communist days of the city, offering gifts to pretty women. 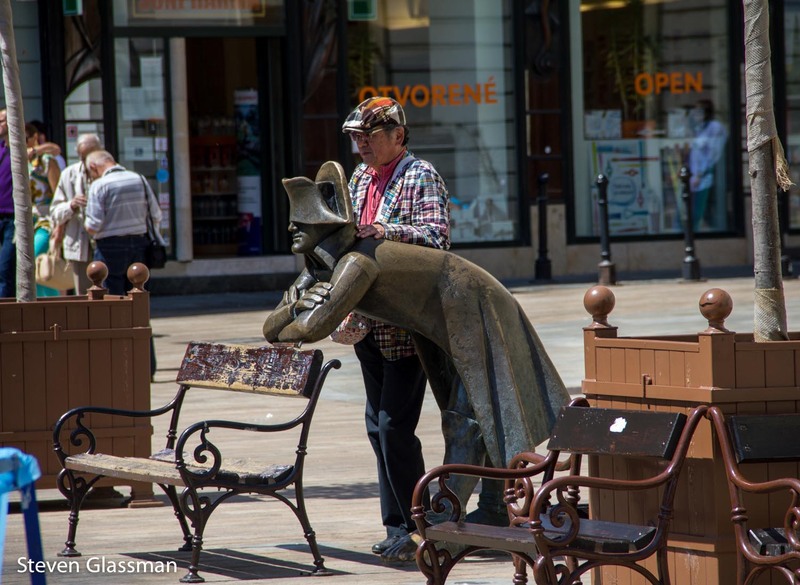 There was also a well known statue called the Paparazzi statue in Bratislava- it peeked around a corner with a camera. I asked my tour guide about it, but the Paparazzi statue was owned by a restaurant of the same name, and both restaurant and statue are now gone. 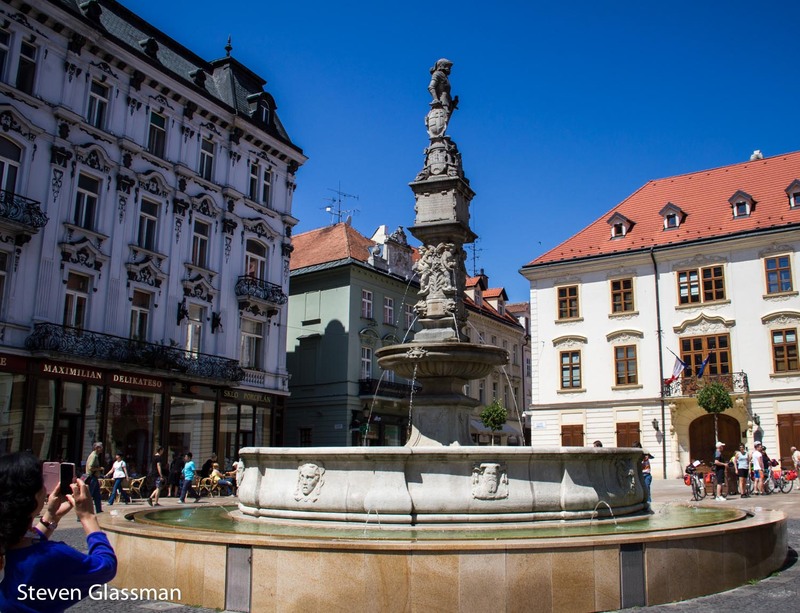 The Roland Fountain (Rolandova fontána) was commissioned by Hungarian King Maximilian in 1527, and was the first fountain in Bratislava. Here’s another one of Bratislava’s great statues. It’s a deliberately unflattering image of a Napoleonic soldier, because Bratislavans have a long memory when it comes to Napoleon’s siege. See the black metal ball to the left of the window in this tower? That’s a cannonball. 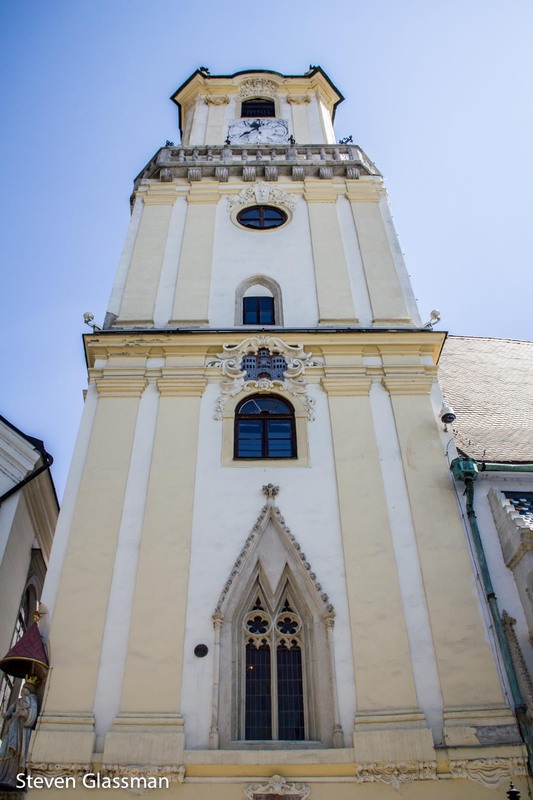 This is the old Town Hall tower, and the cannonball is meant to be a reminder of Napoleon’s impact, no pun intended, on the city of Bratislava. These Berlin Bears are all over Europe. I’ve seen more in Berlin than anywhere else, of course, but they’ve made it to other cities. This one has the coat of arms of Bratislava on the paw on the right (the one that looks like a little castle), and the coat of arms of Slovakia containing the double-barred cross on the left paw. 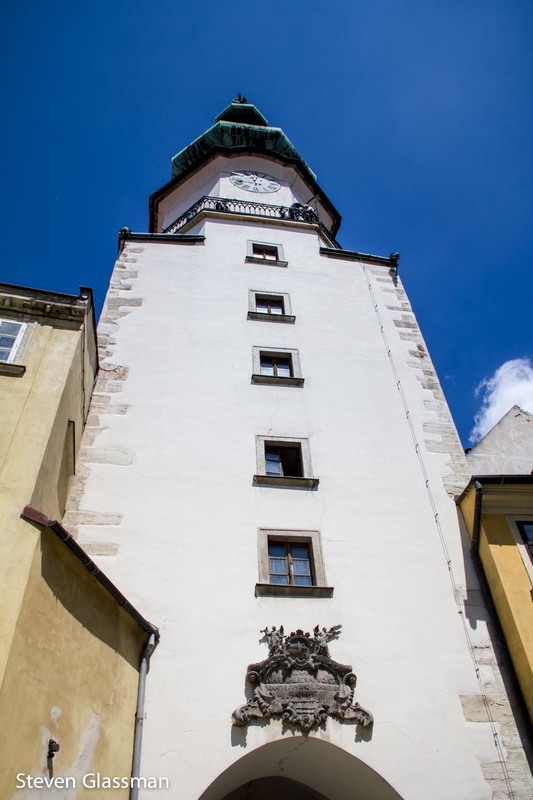 This is the tower of Michael’s Gate, one of the four original main gates to the city. The distinctive roof is made of copper. I thought I had taken a picture where you can see both the tower and the gateway beneath it in one shot, but I guess I only got it in separate photos. This is the old city gate at the base of the tower from the previous photo. 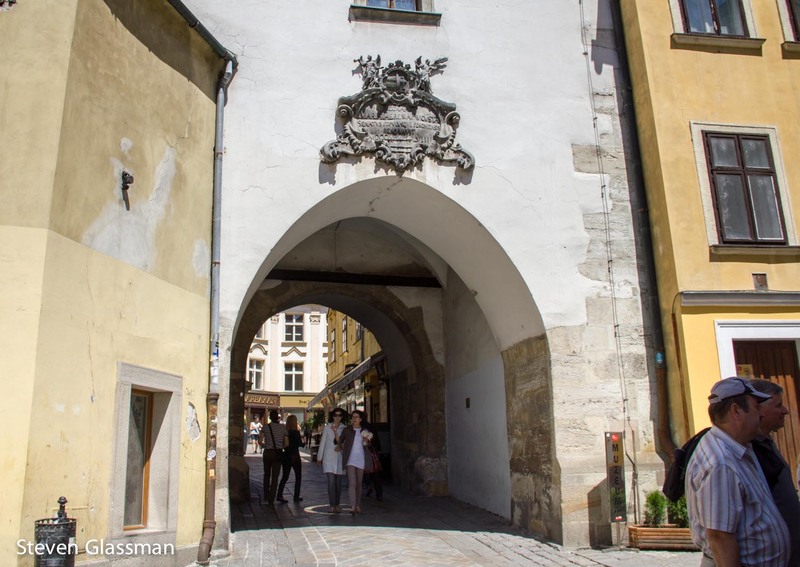 Michael’s Gate was constructed in the 14th century. 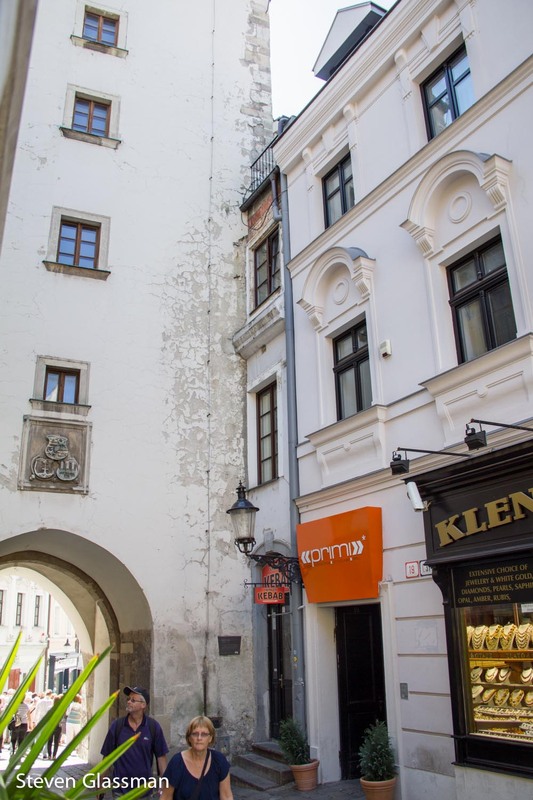 Next to the tower is the thinnest store in the city of Bratislava. It’s been many things over the years, but right now, it’s a Döner Kebab stand. I imagine you can fit almost two people in there at once, but they weren’t open when I walked by so I couldn’t tell you for sure. That long flat buiding on the hill in the left half of this photo is Bratislava Castle. I didn’t get any closer than this. The building on the right is just a picturesque church. 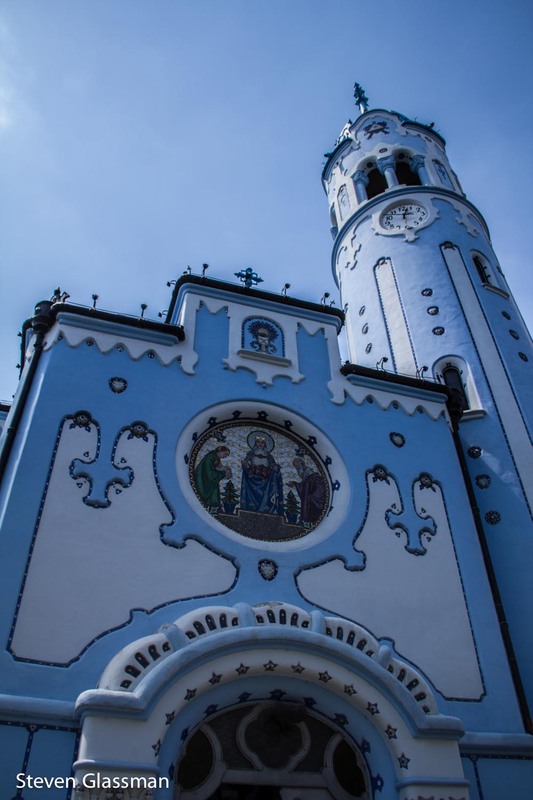 This is the Church Of St. Elisabeth, also known as the Blue Church. I can’t imagine why they call it that. 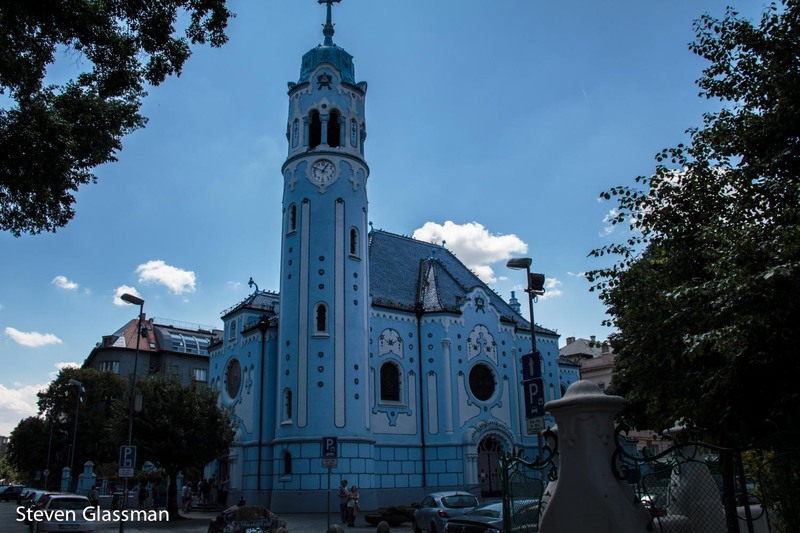 This church is built in the Hungarian Art Nouveau style by Ödön Lechner, a Hungarian architect who was nicknamed the “Hungarian Gaudí“. Even the inside is mostly blue! It kind of looks like a wedding cake, don’t you think? 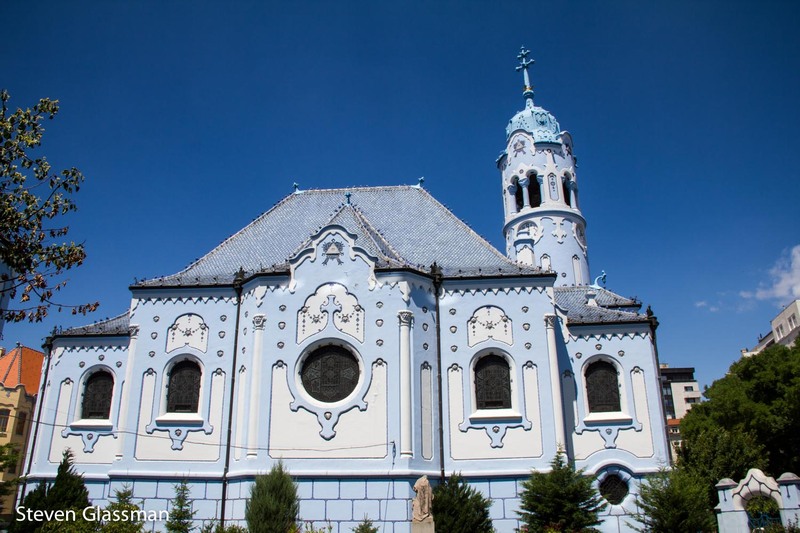 Ödön Lechner also designed this building next to the Blue Church, in the same style. 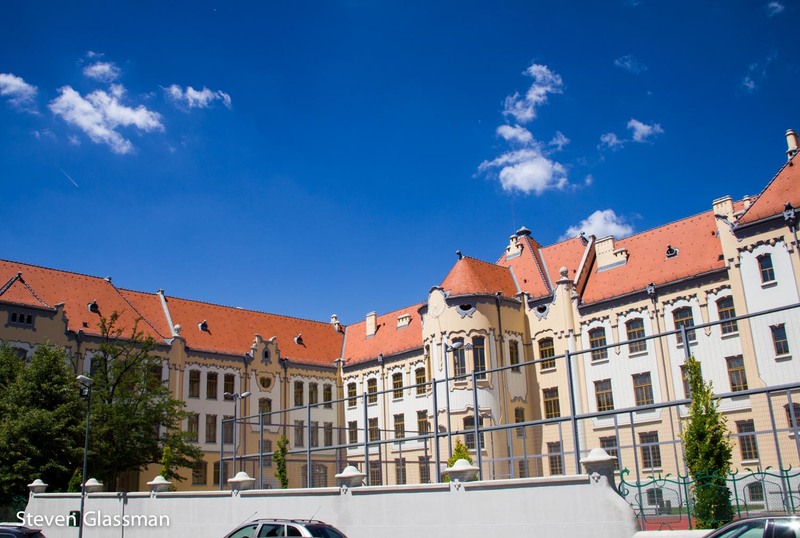 This is the Gymnázium Grösslingová, and if I remember correctly, it’s being used as a school now. 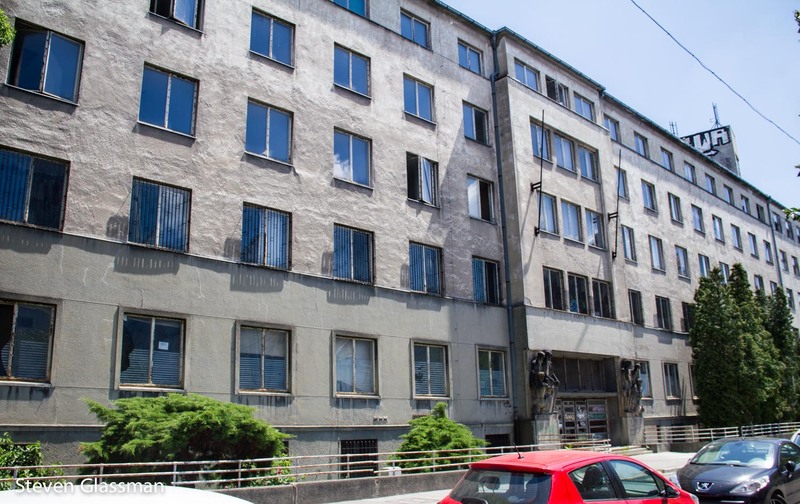 Also across the street from the Blue Church, on the other side, is this creepy abandoned Communist-era hospital. I can’t actually remember the deal with this statue, but I thought it was neat looking. 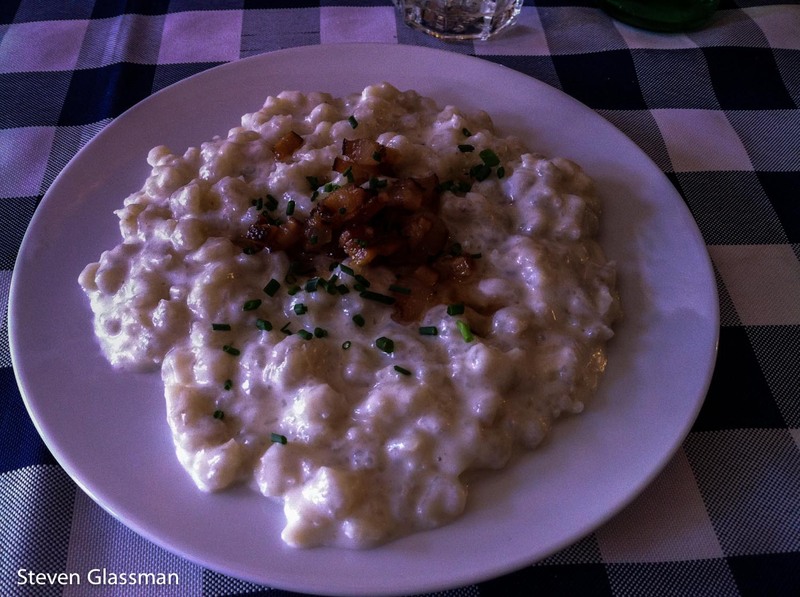 After the tour, I stopped at a recommended local restaurant for a lunch of traditional Slovakian food. I can’t for the life of me remember what this dish is called, but it basically tasted like macaroni and cheese with bacon. It was utterly delicious. I walked past this stately building on my way back to the train station to leave the city. 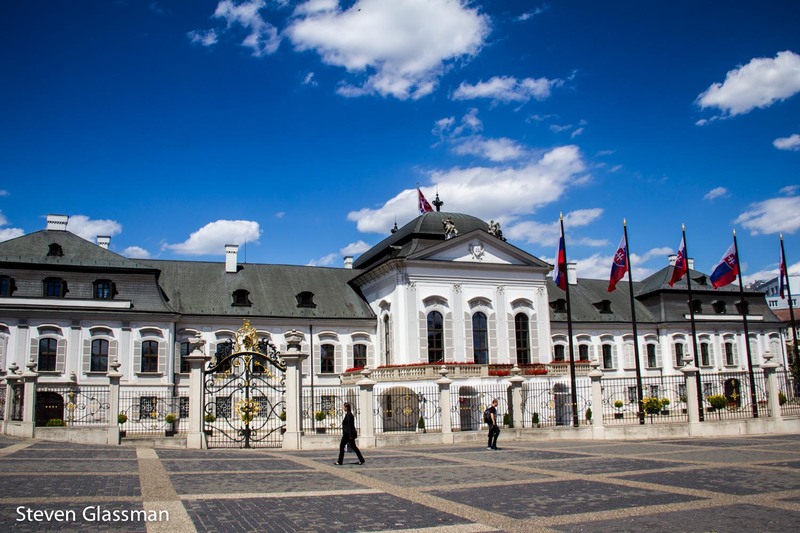 This is Grassalkovich Palace, the residence of the President of Slovakia. 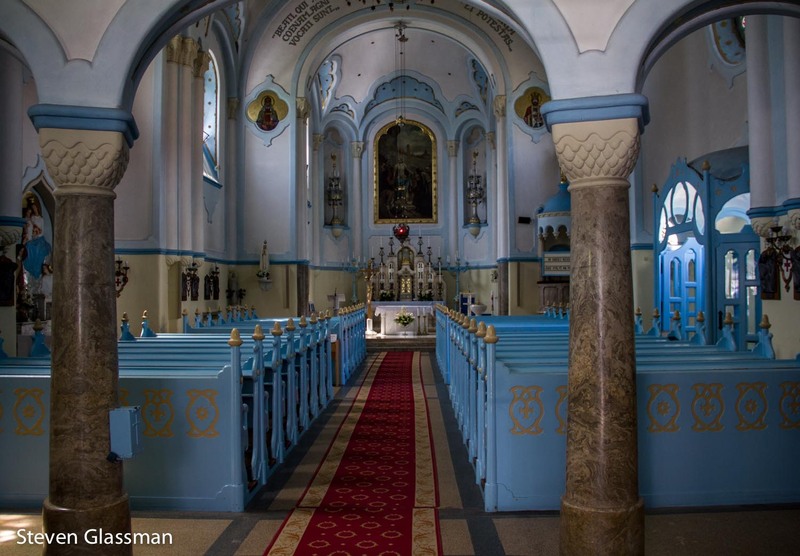 Have you ever been to Slovakia? 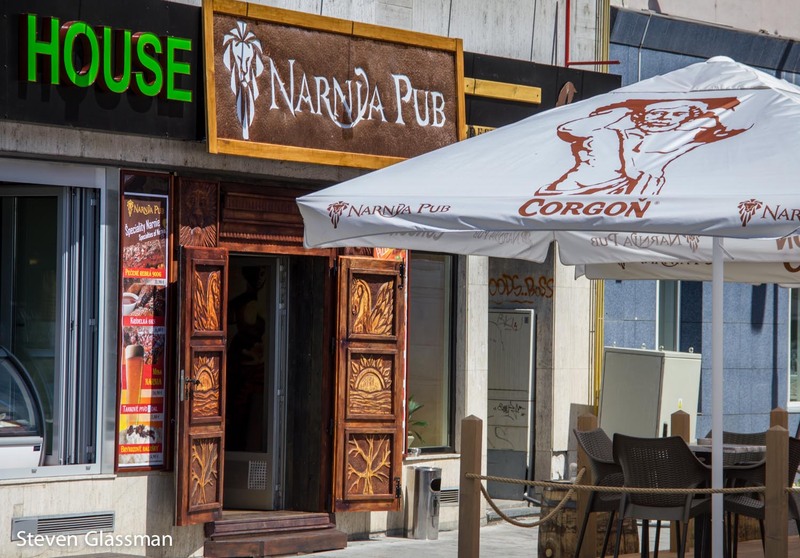 Love the Narnia restaurant! The doors to the place WERE the doors to the wardrobe! I would go there just for that, although the blue church was pretty cool. Oh, I didn’t even register that the doors were the wardrobe doors. That’s brilliant! Haha, Čumil looks like quite a character! 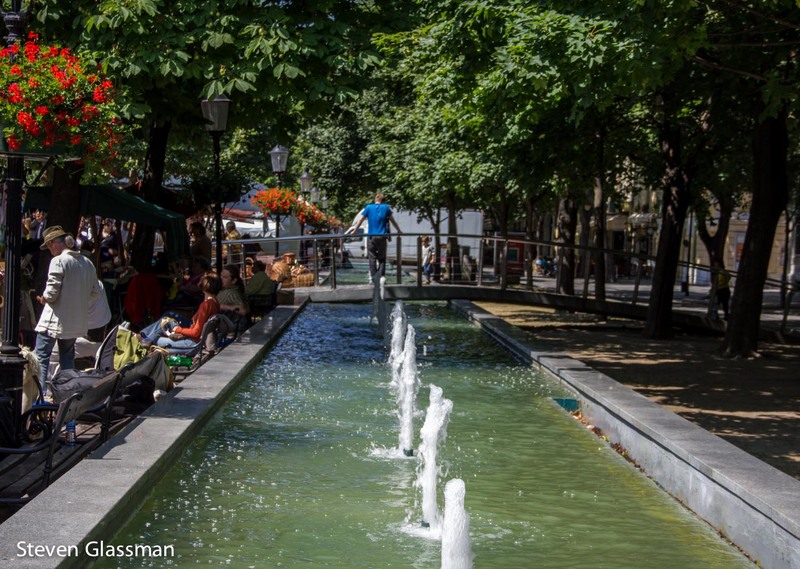 And the city looks lovely – the weather certainly helped! I definitely had outstanding weather for that side trip. Bratislava felt a lot like Prague to me, just much much smaller. Aaah, you got a photo of the creepy communist hospital! I was too occupied with the church. I thought it was interesting, in a creepy abandoned building sort of way.